Umba Vape Review - Daily Vaping Deals & The Best Vape Product Reviews at Vaping Cheap! 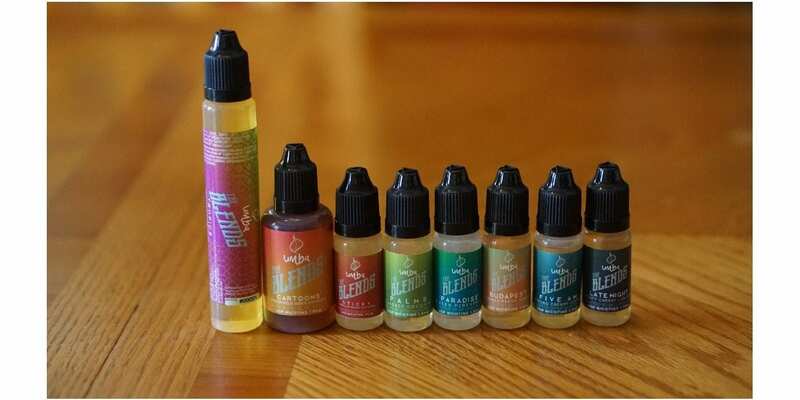 In this review, I’ll be covering Umba Vape’s e-juice line! Umba Vape has 2 different lines which are the Tastemarker WTA (Whole Tobacco Alkaloid) and The Blends Flavours Normal USP Nicotine (WTA Optional). All of their e-liquids are tested from TSNA’s and Diketones, which is great, so you’re a vaper who wants to avoid these, then you’ll have no worries with this e-juice company! Umba Vape’s e-juice is crafted in the heart of tobacco country in Kentucky. Umba Vape is a young, but experienced team that focuses on producing the best possible e-liquid with focus on quality and balance of flavours. Their goal is to provide a premium e-juice at an affordable price that is accessible to all vapers. The do offer a variety of bottle sizes which are 10ml, 30ml and 120ml. The pricing for their 10ml bottles is $3.99, for the 30ml bottle $9.99 and their 120ml bottles $29.99. However, they do have a coupon code “ILOVEUMBA50“, which gets you 50% off all juices sitewide for the month of May! This means their 10ml bottles are only $1.99, 30ml bottles are only $4.99 and their 120ml bottles are only $14.99 after the discount! Also, they do have a stellar rewards program and an amazing referral program as well that can earn up to 50% off orders from a friends referral! In the Umba Vape Review, I’ll go over some of their flavors that stood out to me the most. However, before getting any further I would like to thank Umba Vape for sending these e-juices my way for the purposes of this review. I will give you my overall thoughts about each flavor and let you know whether or not I recommend it! Remember, taste is subjective, so what I may like you may dislike and what you like I may dislike. I will first go over the specific mods and atomizers used to test each of these flavors and then will continue on to the review of Umba Vape! Click Here to Check Out Umba Vape! Flavor Description: The rich, roasted, velvety nuttiness of Forester is reminiscent of an almond and hazelnut praline. The perfect accompaniment for sitting by an open fire on a cool winter’s evening. Or anytime, really. Allergic to nuts? No worries, this Umba flavor uses a synthetic nut flavorant. This is a pretty good flavor, and even though I’m not the biggest fan of hazelnut, I did enjoy vaping it. I must say that this flavor is quite light, and I do wish it was a tad bit more flavorful. On the inhale, I get a mixture of almond and hazelnut. On the exhale, I get the almond flavor first then comes the hazelnut flavor. It is a bit on the creamy side which is what I think makes me enjoy this flavor the most. The mixture of almonds and hazelnut does blend well together, and it does bring forth a pretty tasty vape experience. I do recommend vaping this one with a hotter build such as a Fused Clapton. Honestly, this is a pretty unique e-juice and I’ve never come across any that has tasted similar. Overall, Forester is a light yet tasty almond and hazelnut flavor. Like mentioned previously, I do wish it was a bit more flavorful. Maybe some additional steeping time might help this case, but I’m not too sure. Regardless, I did enjoy vaping it and I could see myself vaping this flavor during the winter time. If you’re a fan of almond and hazelnut flavors, then I can easily recommend Forester! Flavor Description: Take a good dollop of smooth peanut butter, a generous smudge of vanilla bean and fold together with thick, heavy cream. You’ve got that smooth, soft, luxurious Suede. This is a really solid peanut butter vape! I love a good peanut butter vape when I come across one. Some peanut butter vapes I’ve encountered are quite harsh or just doesn’t taste right due to them being “dry” tasting and not creamy. I’m happy to say, this one does not fall into that category. On the inhale, I get a nice creamy peanut butter flavor. However, on the exhale is where it changes a bit. Right as you exhale, you get the same creamy peanut butter flavor, but then it’s followed by hints of vanilla. The mixture of peanut butter and vanilla is quite tasty! To me, what makes this e-juice really good is the creaminess. I must say that this one also vapes great on a hot build. If you prefer more of a vanilla taste, then vaping it a lower wattages or a cooler build will bring those notes out more. All in all, Suede is an excellent e-juice that is well blended together. The throat hit is silky smooth, and the vapor production is top notch for a 70VG/30PG blend. If you’re a fan of peanut butter flavors and looking for a creamy one, then I can easily recommend this flavor! I will say this right away, I am not the biggest fan of tobacco flavors. With that being said, this one is quite different than the tobacco flavors I’ve tried, and is a bit heavier with the tobacco flavor as well, which isn’t necessarily a bad thing, depending on your flavor preference of course. On the inhale, I get a light caramel and vanilla flavor. On the exhale is where this flavor comes together. Right as I exhale, I get a creamy caramel flavor followed by a smokey tobacco just as the description states. The vanilla flavor is there, but is in the background. I taste everything on the exhale, the caramel, tobacco and vanilla, which is a huge pro! The smokey tobacco flavor provides an interesting taste when paired with caramel and vanilla, and the more I vape it, the more I actually liked it. There is a subtle sweetness about it too, which certainly makes it more enjoyable. Overall, I wasn’t expecting to like Sticky, but I was surely wrong. As mentioned previously, the more I vaped it, the more I liked it. This is blended really well, and vapes great at both lower wattages and higher wattages. If you’re a fan of RY-4 flavors, definitely give this one a shot! Flavor Description: Feel like a kid again and take pleasure in the simple yumminess of fresh baked cookies and a tall glass of creamy chilled milk. I will state this right away, this is my favorite flavor from Umba Vape! I love dessert flavors, especially cookie vapes! However, not all cookie flavors are good, but this one is fantastic! On the inhale, I get a nice creamy cookie flavor. I would assume the creaminess is the “milk” flavor in the description. On the exhale, I get the same creamy cookie flavor, but it’s followed by a caramel flavor. The caramel flavor isn’t in the description, but I do taste it on the tail end of the exhale. The caramel certainly adds to this e-juice for sure. The cookie flavor is well done, and tastes exactly like if you took a bite into a cookie that came right out of the oven and sipped on a glass of milk. I can easily vape this flavor all day without getting tired of it. I will say though, this flavor is not the friendliest to your cotton, but I honestly didn’t mind due to how much I enjoyed vaping it. All in all, Cartoons is an excellent dessert flavored e-liquid. The throat hit is silky smooth, and the vapor production is great, especially when considering it’s a 70VG/30PG blend. If you’re a fan of cookie flavors, then I highly recommend Cartoons by Umba Vape! Flavor Description: Bottled sunshine! Refresh, unwind and bask in Umba’s ode to the Pina Colada. This is a spot on pina colada flavor! I haven’t tried any pina colada flavors before, but this tastes exactly like if you’re actually drinking one! On both the inhale and exhale you get a nice and sweet pina colada flavor. The dominant flavor throughout the inhale and exhale is pineapple and it is very natural tasting. On the exhale, you do get hints of coconut as well, which is what gives it that pina colada taste. In addition, there is a slight creaminess to it, making it that much better. There isn’t any cooling effect that I can detect with this one nor any rum taste. The throat hit is extremely smooth, and the vapor production is great. All in all, this is a solid flavor, and with the Summer coming, this is something I’d definitely pick up to vape. If you’re looking for a spot on pina colada flavor or something to vape for the summer, then this is a must try from Umba Vape! Flavor Description: Bright, crispy and sweet-ripe apple is paired with golden toffee-fudge to make an irresistible dessert vape. If you’ve read our previous reviews, you can tell that I’m not the biggest fan of apple vapes. With that being said, this one is actually pretty good! On the inhale, you get a fresh green apple flavor that is authentic tasting. On the exhale, you get the same tasty fresh green apple flavor, and it is followed by hints of toffee. The toffee flavor is quite light, but when vaping this e-juice you are left with a nice toffee taste. These two flavors are blended really well together, and brings you a very tasty vape experience! I’ve never had one like this before as many apple vapes I’ve tried are apple pie type flavors, so I’m glad Umba Vape went a different direction with this one as it surely paid off. All in all, this is a solid vape and even though I’m not the biggest apple flavor fan, I can vape this throughout most of the day without getting tired of it. The throat hit on this one is also very smooth, and the vapor product is as you’d expect from a 70VG/30PG blend. If you’re a fan of apple dessert flavors, then I think this one from Umba Vape is definitely worth a shot! Flavor Description: Full-bodied, dark-roasted coffee with a generous splash of cream and subtle dash of smooth bourbon. A coffee vape to start the day on a good note. This is a pretty interesting vape, and I will state right away if you’re not a fan of dark coffee vapes, then you probably won’t like this one. With that being said, on the inhale I get a sweet dark coffee flavor. On the exhale, I get the same sweet dark coffee flavor, but it is creamy. On the tail end of the exhale I get hints of the bourbon flavor as mentioned in the flavor description. The mixture of sweet and creamy dark coffee and bourbon actually blends really well together and brings together an excellent morning vape. While I can’t vape this all day, I can surely vape this in the morning while drinking some coffee! All in all, this is a very good coffee vape that brings together different flavor notes and delivers. The throat hit is also very smooth just like all of the other flavors, and the vapor production is great. If you’re a fan of coffee flavored e-liquid, then I can easily recommend Five AM by Umba Vape! Umba Vape offers some excellent quality e-liquids at affordable prices. These 7 flavors reviewed are what stood out to me the most, and were all enjoyable. In addition, each flavor is unique and is much different than other e-liquids I’ve tried before. Cartoons was by far my most favorite out of the entire line, and is an e-juice I can easily vape all day without getting tired of it. The nicotine they’re using provides you with an extremely smooth throat hit with no harshness whatsoever. If you’re interested in trying some for yourself, keep in mind for the month of May they’re having a sale where you can get 10ml bottles for only $1.99, 30ml bottles for only $4.99 and 120ml bottles for only $14.99 using coupon code “ILOVEUMBA50“! They also have a great loyalty program and referral program that’s worth checking out! All in all, Umba Vape has some pretty tasty flavors for excellent prices, especially when you consider the sale they’re running. If you’re looking for some great tasting and affordable e-juice to try, I definitely recommend checking out Umba Vape! I hope this article helps you find your next all day vape! Feel free to leave any questions or comments below! Thanks for reading! I buy my liquids from a store near where I live. I spent $15.00 for 60 ‘ll. Of what they call Coconut. I put 18 nicotine in it.. tgere was Absolutely NO FLAVOR!!! I took it back and was told..” oh well, FDA governs whas we our in the bottles”. I was shocked when I read tge reviews and most of them we about Flavor. I’m going to try Umba to see if what is said is trurgdul.